AccessMedicine has launched a new feature with the addition of Clinical Prep. What Clinical Prep does is help to bridge the gap between course work and actual patient care experiences by providing access to common clinical questions. "Clinical Prep offers more than 650 core topics essential for medical students. Within these 650+ core topics, students will find over 50,000 questions." The questions and answer choices are written; as well as reviewed, and updated; several times a month by specialists who work in clinical settings. It provides a warm up for your brain before setting out on clinical rotations. It helps students become familiar with clinical workflow and issues surrounding each disease. Its topics and questions serve as a point-of-care tool in the wards. Clinical Prep’s specialty/topic lists align with the USMLE Step 2 content outline and are the same topics as those found in "First Aid for the USMLE Step 2 CK". Which means that diseases included in this feature are likely to appear on the Step 2! We are pleased to announce that the Anne Ross Library at UMHS now provides the DynaMed Plus clinical-decision support tool to all our students and faculty! The DynaMed Plus clinical point-of-care database has been redesigned! The focus of DynaMed Plus is to provide comprehensive clinical decision support with the fastest time-to-answer possible. The content is all about the evidence and is updated on a daily basis! The search feature has been redesigned for quicker access and images and a calculator filter have been added. Included are evidence-based treatment recommendations, medical graphics, algorithms, radiological imaging, expert reviews, etc. Specialty content along with Micromedex® drug information is integrated into the database and all is optimized for off-line mobile viewing with the downloadable app. View this short video tutorial highlighting the features of DynaMed Plus, how to perform a search, and how to download to your mobile device. For more detailed instructions on setting up the mobile app click here. UMHS faculty and students login from the link for DynaMed on the Library Home Page using our EBSCO login. 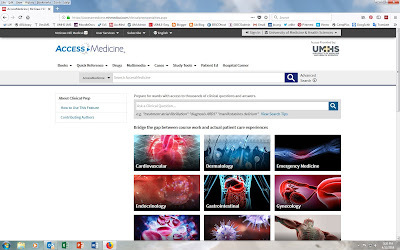 UMHS is currently holding a trial for our faculty and students of McGraw Hill Medical's new ClinicalAccess database, until October 30, 2014. Contact the Library for login details and take 10 to check our this excellent product before it is too late! Leave your comments here on the Library Blog and let us know what you think of this new clinical resource. "ClinicalAccess is a clinical decision support tool that provides healthcare professionals with specific answers to more than 120,000 physician-answered questions - enabling busy clinicians to deliver superior care with maximum speed and efficiency." 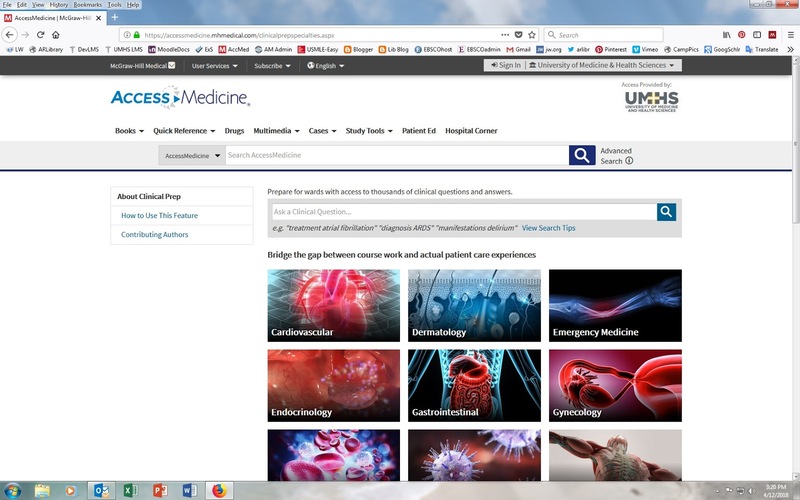 "Powered by leading online clinical resources - AccessMedicine, Access Emergency Medicine, AccessPediatrics, and AccessSurgery - ClinicalAccess delivers trusted information, essential to effective patient care, based on hand-selected answers drawn from landmark references such as Harrison's Principles of Internal Medicine, Tintinalli's Emergency Medicine, CURRENT Medical Diagnosis & Treatment, and other essential texts." With the Omnio® medical iPAD app 'up your sleeve' you can truly hold all your favorite medical must-haves 'at-hand'. Omnio was created by Skyscape Medical Resources to arm the medical professional with the latest information they need to face whatever their day may throw at them. Omnio meets your daily need for medical news, medical reference, a drug guide, calculators, and ebooks. Pull in your UMHS access to DynaMed, the acclaimed clinical point-of-care database from EBSCO, and away you go! If you already use the Skyscape app ( for example for DynaMed), you can sign in to Omnio with your existing credentials. When you enter, check the “Library”—you’ll find your favorite mobile resources waiting for you. For further help to set this up come and see us in the Library.